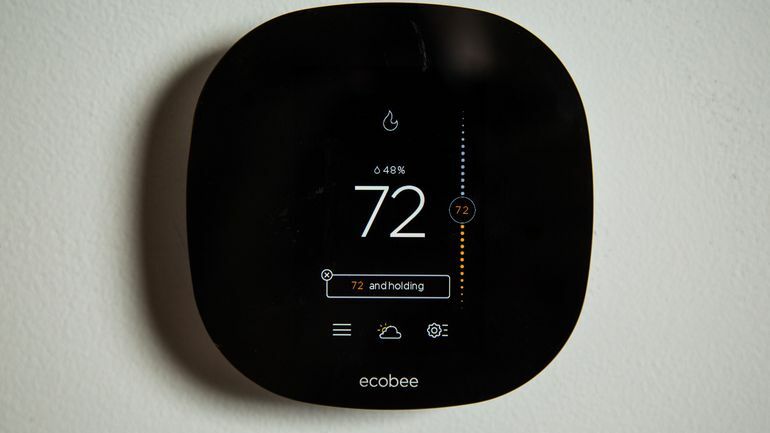 Toronto-based company Ecobee that produces wifi-enabled smart thermostats, has announced a more affordable version of their HomeKit-enabled thermostat with the Ecobee3 lite version. The new Ecobee3 Lite isn’t the company’s first such device, but it does mark brand’s attempt to hit a much lower price point. With a $170 MSRP, it costs $80 less than the original Ecobee3 as well as Nest, and is $30 less than the Honeywell Lyric. But in order for company to hit that price and also keep the flagship model relevant, some features just had to go. This new device also has the benefit of voice control functionality, through integrations with Amazon Echo’s Alexa and the Apple HomeKit’s Siri. The smart thermostat is wrapped in a white plastic housing with a prominent semi-reflective black face. Most of the front side is just taken up by a 3.5-inch display. The touchscreen is easy to read from most angles and the information displayed is clear and easy to parse. At rest, the smart thermostat displays the current indoor temperature and weather, but when you walk up to it, this device recognizes your approach, at which point the screen morphs to show temperature controls and icons for accessing sys settings. Using the Ecobee3 Lite is as simple as you would hope. Just slide a finger up and down on the right side of the 320 x480 display to adjust the temperature of whichever mode you are in: heat, cool or auto. The device will learn your patterns over time and adapt continuously. All the settings are accessible via icons on the thermostat display, in the app and also on the Ecobee site. The thermostat can be paired with Amazon Echo Dot and used with Apple HomeKit for voice control, too. IFTTT support is here for even greater levels of the customization. Additionally, the device works with the Samsung SmartThings and the Wink, among others. The new smart thermostat will be available starting Oct 31st, 2016 with a $170 MSRP and it comes with a three-year warranty at Amazon.com, HomeDepot.com, BestBuy.com and ecobee.com.